Supplies: CS: Worldwin, stamp: Autumn Leaves, PP: Calambour, alphas: Doodlebug Loopy Lou, stickers: Bo Bunny, felt creatures: Creative Company, flower: Bazzill, misc: ribbons, fluid chalks, button, page pebbles, fastenater staples, jewels, pearls, gloss. All supplies from KT Crafts, Nettans Scrapbooking4You, Creative Company and Panduro. This was the first encounter with the sea for Lorelai, my granddaughter. All supplies from Nettans Scrapbooking4You, KT Crafts and Creative Company. Supplies: CS: Bazzill and DCWV Metallic Stack, PP: K&Co Wild Saffron, tags: QK cut in handmade paper from Svartvik Paper, buttons: DressItUp, alphas: Cuttlebug Olivia, stamp: Panduro, misc: Fluid Chalks, embossing powder, UTEE. All supplies except the stamp and handmade paper can be found at Nettans Scrapbooking4You and KT Crafts. The title parts have been cut from DCWV Metallic Stack, Cuttlebug Olivia cut in doublesided tape attached and covered with gold embossing powder, heated and then covered three times with UTEE. After cooling the cardstock was cracked by bending it. 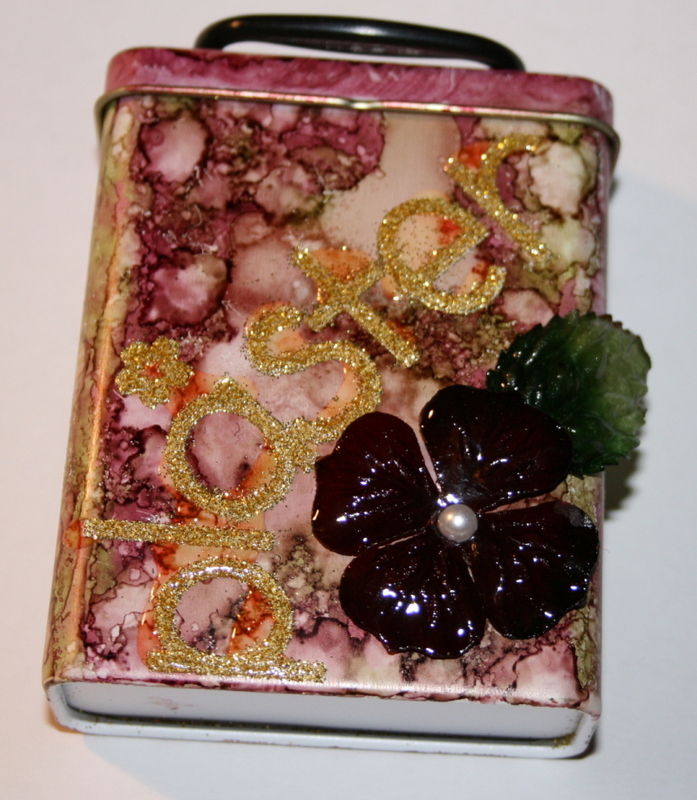 All supplies from KT Crafts: Band Aid Tin, Alco Inks, Stick With It from Doodlebug, Gold Glitter from an ATB set (Glitter & Flock), Prima Flowers and Leaves, UTEE and a Kaiser pearl. I started with altering pen cases for my pens and brushes, using K&Co Ancestry paper, flowers from Prima and some jewelry stuff together with ribbons. I was so pleased with this set, so I decided my tools needed a new place to live! For this I’ve used a set of “paper bags” made of wood from Creative Company. I have used basically the same products. But where should my stickers live? I found this card portfolio at the local supermarket. The flowers have been covered with UTEE, creating an almost glass-like finish. Oooh, now I have to pick some blogs that I like… Thank God it says “at least 7” – because it’s hard for me to keep the number down! I have to start with Vicki, one of my fellow DT’s at KT Crafts, who during these past months has become a very dear friend. Beth, one of the members at KT Crafts forum. 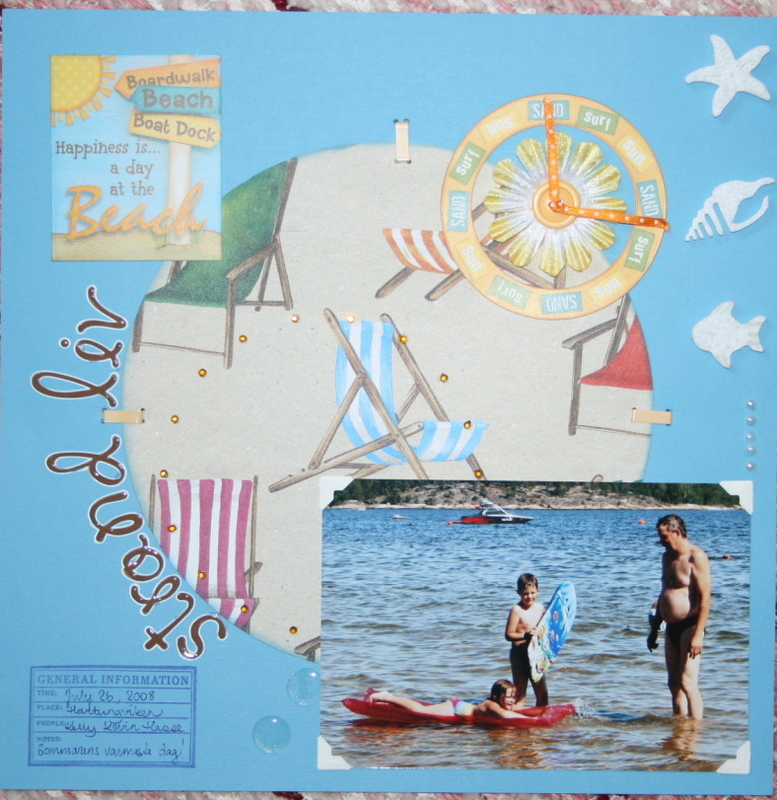 She is a very talented scrapbooker, and I just love her stuff! Helena, a long lost friend that I got in contact with earlier this year. 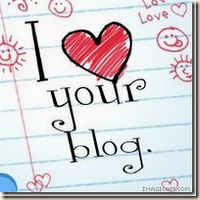 Her blog is filled with cards that I just love! 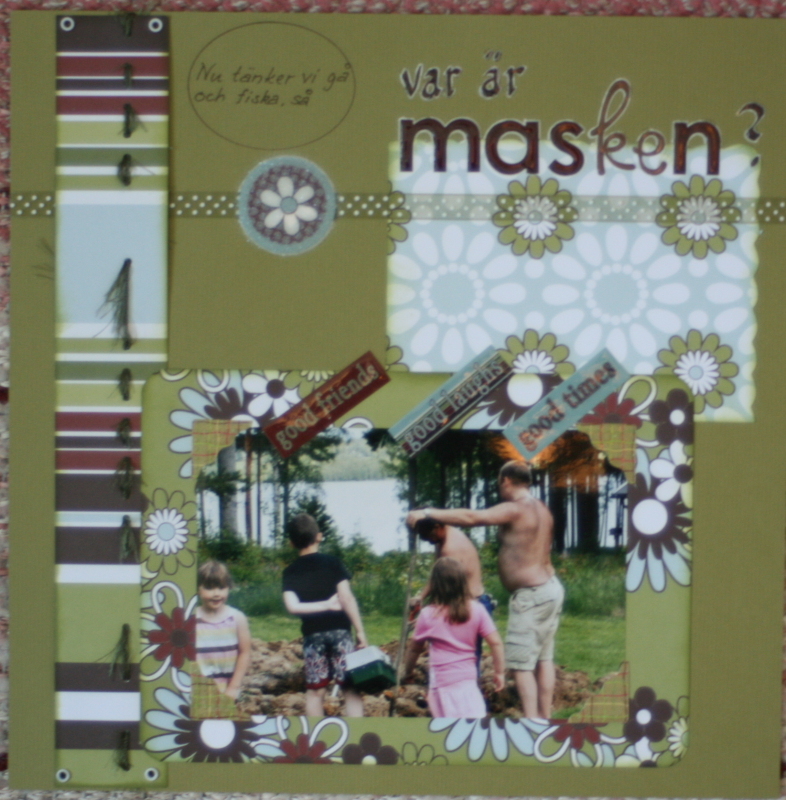 Over to Norway and Jorunn, which to my surprise is just as talented as a scrapper as she is as a cardmaker! While we’re going west, I’d stop by at Rose’s to get me a cup of coffee! Someone that fills my heart with glee, is Glee! The seventh one goes to Jessica, my daughter. This is a follow-up on an earlier LO, Digging for Worms. The kids are ready to go fishing, so they wonder if there are any worms in the hole!